Research is at the core of what we do as a lab. We conduct research through empirical methods (organizational surveys and experiments) as well as systematic reviews and meta-analysis of empirical evidence. Our research is in the areas of talent management and career development. More specifically, our work seeks to advance knowledge on talent science – the understanding of human potential and performance as well as the processes that engage and develop these capacities in organizations. Our lab takes pride in high quality research and engaged scholarship. 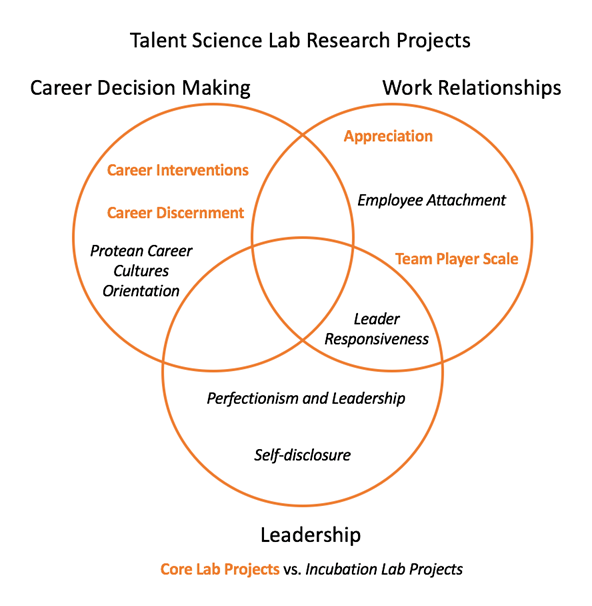 Career Interventions: In collaboration with the Career Development Office, we have developed several positive online interventions to increase career exploration of graduate students. Members include: Kathryn Doiron, Briana Pisauro, Pooja Sathyanarayanan, and Kristine Powers. Appreciation in the Workplace: This research project focuses on furthering the understanding of appreciation in the context of the workplace. Team members aim to use exploratory, qualitative methods to evaluate the positive and negative effects of expressing or receiving appreciation at work. Members are currently involved in gathering existing literature on topics relevant to appreciation, participating in theoretical discussions on the concept, and forming qualitative interview questions around appreciation. Future tasks will include the gathering and analysis of responses from participants and developing a clearer understanding of appreciation at work. Members Include: Christina Putrov, Kathryn Doiron, Sharon Hong, Somi Aggarwal, Dr. Jeff Yip. Career Discernment Scale Development Project: This project involves in the development and validation of a career discernment scale. The intent of the project is to develop a measure for research on career decision making as well as an applied tool to assist people in making more informed career decisions. To date, the items for the measure have been created and the project has been submitted to IRB for review. Data collection and analysis will be ongoing through the Fall semester. The project is focused on scale development and involves in the analysis of data using SPSS and EXCEL. The specific task of analysis includes factor analysis, regression, correlation, and so forth. It also involves the writing up of results for academic publication and conferences. Members include: Dr. Jeff Yip, Haoxiong (David) Li, and Ellen Ensher (Loyola Marymount University). Team Player Scale: The purpose of this project is to create a team player scale based on behavioral components. The aim is to discover which skills and behaviors are most likely to indicate someone who will do well contributing and working with a group of people. A team player is generally someone who is actively contributing to the group, able to communicate effectively with the team, and is able to sacrifice one’s goals/time for the betterment of the team as a whole. Next steps of the project include cutting down total number of questions, surveying professionals to start factor analysis, and examining literature to craft different validities needed for testing the scale. Members include: Ben Falls, Sevelyn VanRonk, and Justin Samortin. Protean Career Orientation: We are currently expanding the current protean career attitudes scale by generating additional items and validating them through multiple studies. Members include: Kathryn Doiron, Christopher Chen, Brandon Sorenson, Lizz Kolowosky, and Dr. Jeff Yip.